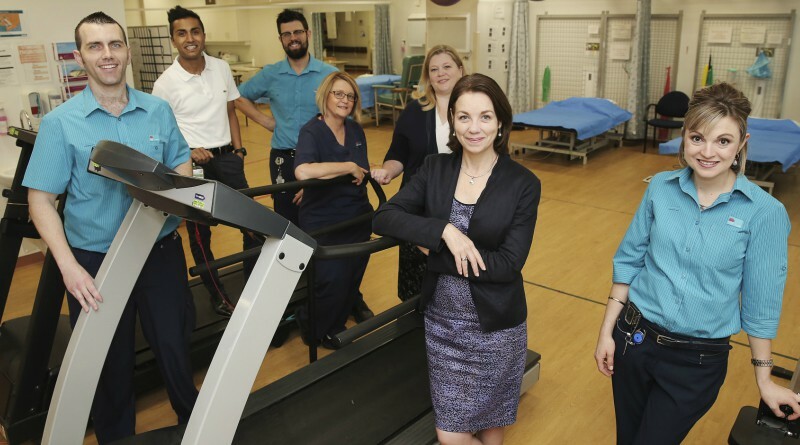 Westmead Hospital physiotherapists Gerard Regan, Chrissian Segaram, Josip Sulentic, cancer clinical nurse specialists Meg Hughes, Dr Amy Hayden and Associate Professor Sandra Turner with physiotherapist Katherine Maka. The new initiative, called the ‘X-Men program’, has been specifically designed for men undergoing hormone therapy to treat their prostate cancer. Men use body weight and resistance exercises to help them feel stronger in mind and body after hormone therapy for prostate cancer. The program is a partnership between Westmead Hospital’s physiotherapy and oncology departments. Westmead Hospital physiotherapist Gerard Regan said many of our patients don’t feel comfortable in a commercial gym setting or do not know what exercise is appropriate while undergoing treatment for prostate cancer. “In a majority of cases we find that patients don’t participate in regular exercise programs, and exercise is hugely important when undergoing hormone replacement therapy, Mr Regan said. “So far we have helped 31 men regain their strength and confidence through our support and their will power. Girraween resident Ganni Spiteri said getting fit had helped in other areas of his life. “Doing these exercises has given me plenty of energy and has made me feel better,” Mr Spiteri said. “I looked forward to going to the sessions and enjoyed the interaction with other people and doing exercise. The X-Men program is available to Western Sydney Local Health District patients undergoing androgen deprivation therapy for their prostate cancer. Westmead Hospital “X-Men” program patient Ganni Spiteri and physiotherapist Gerard Regan. Are you Westmead’s top admin worker?